Destinations work hard every day to build their communities on Facebook. But imagine the challenge when your destination faces some of the most detrimental factors in tourism: inaccessibility, lack of name recognition, high costs, low hotel inventory, sub-zero temperatures, and an entire month of 24-hour-a-day darkness. You read that correctly. There is, in fact, destination marketing itself even though the place spends 30 straight days between December and early January in complete darkness. Meet Inuvik, Canada’s coldest tourism destination and perhaps the country’s coolest as well. Last year, visitors from six different continents ventured 200km above the Arctic Circle to visit the roughly 3,000 person-town of Inuvik. Domestically, tourism is increasing with tourists arriving from all around Canada, an astounding fact considering that the majority of the county’s population lives closer to Mexico than it does to Inuvik. So how did an arctic town with one stoplight and a springtime festival that features muskrat skinning and tea boiling become a rising international tourism destination? Through a compelling Facebook page that serves as an example to the tourism industry of effective, impactful and valuable social media marketing. Below is a case study on how Inuvik used limited resources and a minuscule audience to boost tourism through organic Facebook marketing. In 2013, Inuvik’s destination marketing organization, the Town of Inuvik, began a revamp of the destination’s 1,700-follower Facebook page. Of those 1,700, more than half lived in the destination and the remaining followers were mostly scattered throughout the vast arctic landscape of northern Canada. The page did not have a library of content to pull from and lacked an advertising/promotional budget. In short, the page’s prospects were as bare as the frozen Arctic Ocean near the town’s border. However, knowing that internet usage is exceptionally high in the Arctic, the page admins set up comprehensive nets across the web to capture content being created by local residents and the few visitors that ventured up north. Geocoded searches using Hootsuite were set up to find every tweet ever posted within a 50km radius of the town. Deep searches were performed in Pinterest. Instagram search tool Gramfeed (now called Picodash) was used to compile every Instagram photo posted from the streets of Inuvik. Hashtags were searched on Iconosquare and image re-sharing rights were requested from the photographers. An archived version of Google Blog Search was plundered to find any past websites and blogs that mentioned Inuvik. Even the town’s Mayor was asked for photos when the content team heard he had a digital camera and enjoyed photography as a hobby. The tedious searching yielded great results: a wealth of authentic, user-generated photos, videos and blogs about one of the world’s most unique destinations. With an arsenal of arctic content, the Inuvik Facebook page became the town’s daily newspaper. After all, half of the town’s residents were already following the page. The content connected emotionally, grabbed attention, offered value to local residents, and peppered with arctic humour, told the unique stories of the destination. It also delivered on a dependable, daily basis. When the page became a valued representation of the town and its people, the local audience began rewarding it with shares. One post reached over 19,000 people organically after 10% of the Inuvik’s population shared it on their own Facebook newsfeeds. After several months of engaging on a daily basis, Inuvik’s residents had essentially turned into the town’s global paperboys. The reach didn’t end there. In 2015, one of the page’s posts reached a writer for Canadian Buzzfeed, organically. 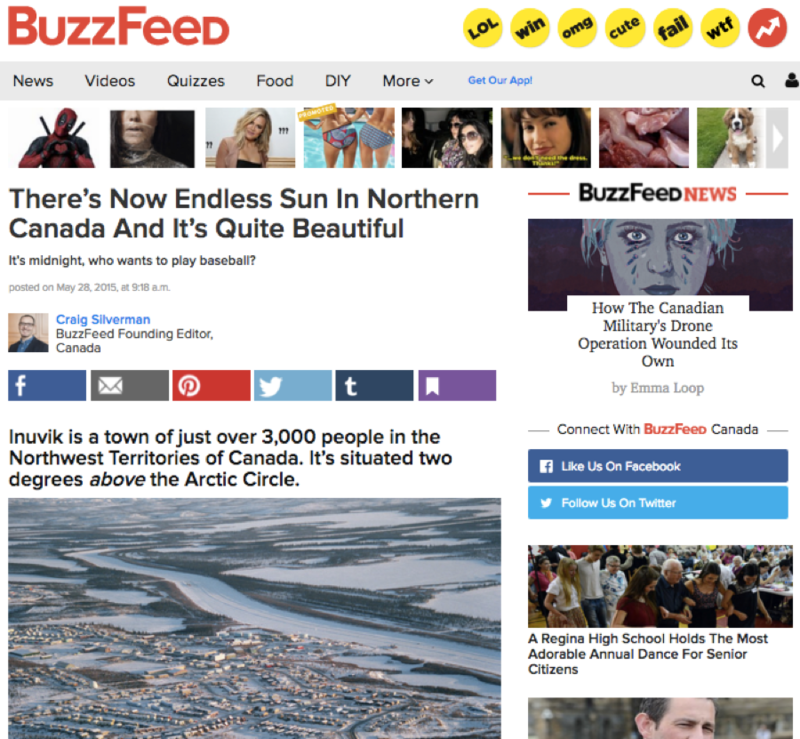 The next day, Inuvik was front and centre on one of the country’s most-visited websites. Two days later, Inuvik was on the AOL News homepage in the United States. 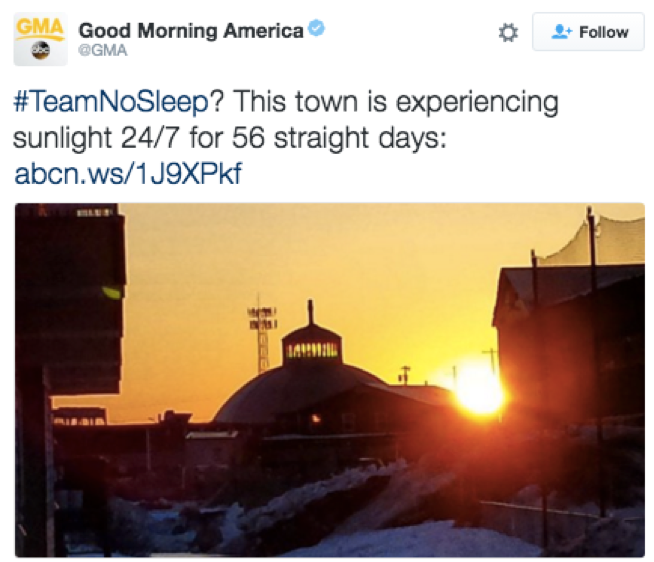 This attention caught the eye of a producer for America’s most-watched morning TV show, Good Morning America. 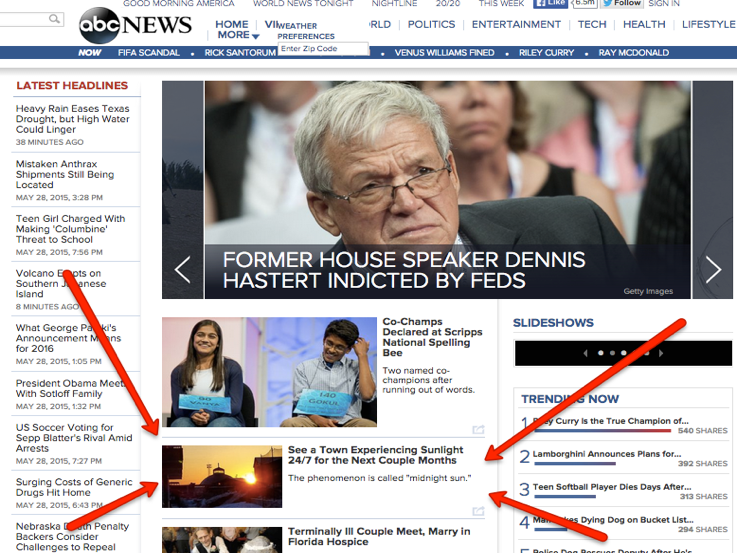 The same day, Inuvik was on the homepage of ABCNews.com. Tourism is up in Inuvik and the Facebook page and the exponential exposure it created surely has something to do with it. What can a small town teach a larger destination? Great ideas and content will spread, regardless of the size of your audience. The idea usually starts with a few people, and finds the most passionate people around them to spread broadly. If your destination’s social media accounts are mostly followed by locals, you have the most qualified army of marketers. A page followed by 5,000 local residents can be much more powerful than a page followed by 5,000 potential travellers. In Inuvik’s case, the town didn’t change anything about its tourism product. It’s still otherworldly cold, still light-years away from any major city, and still skinning muskrats. But its social media content was repackaged and optimized to spread. The content was then delivered on a daily basis and gave the townspeople something they were proud to share. 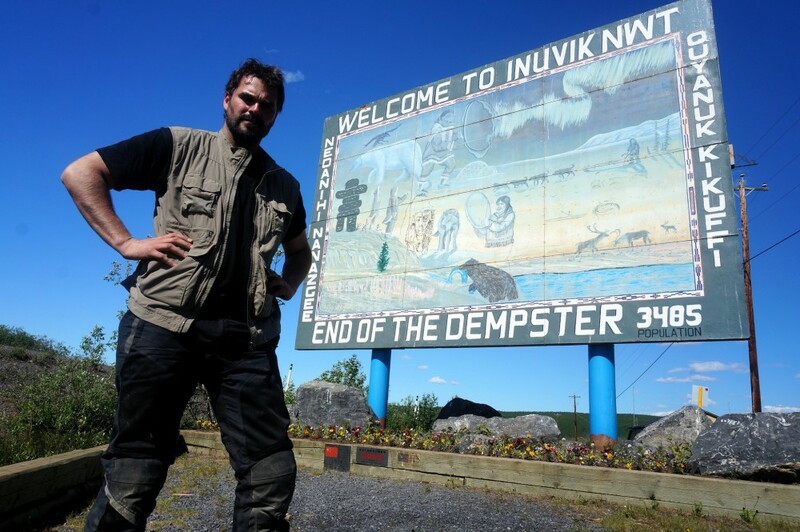 The word on Inuvik spread because the right stories were told on the right channel to the right storytellers, who eventually pushed the tourism message to the target audience. It doesn’t matter that Inuvik’s target audience is very small. Many potential travellers might not need, want or be able to explore what Inuvik has, but visitation didn’t increase because the destination presented itself as something for everyone. Visitation increased because, in addition to offering breathtaking wilderness and once-in-a-lifetime tourism experiences, the content on Inuvik’s Facebook page was compelling and unique and appealed to small niches. What kind of niches? People looking for extreme adventure and bragging rights. Or people who are so tired with their cities that they want to go to the end of the world. Or extreme drivers who want to test their handles on an ice road. Inuvik proves that successful destination marketing is weatherproof and can be done no matter what restraints afflict a tourism product. Inuvik also proves that highlighting the unique and exceptional is crucial to successful destination marketing. Facebook is a tremendous marketing tool because it rewards those who create the best, most engaging content. Every destination has engaging content but they must find it, commit to it, package it correctly and present it to an audience that appreciates it. If a destination produces basic, run-of-the-mill brochure-style content (most beaches in the world look the same!) to its large audience, it’s losing attention to the clever, peculiar content made by the competition, even if their audience is significantly smaller. 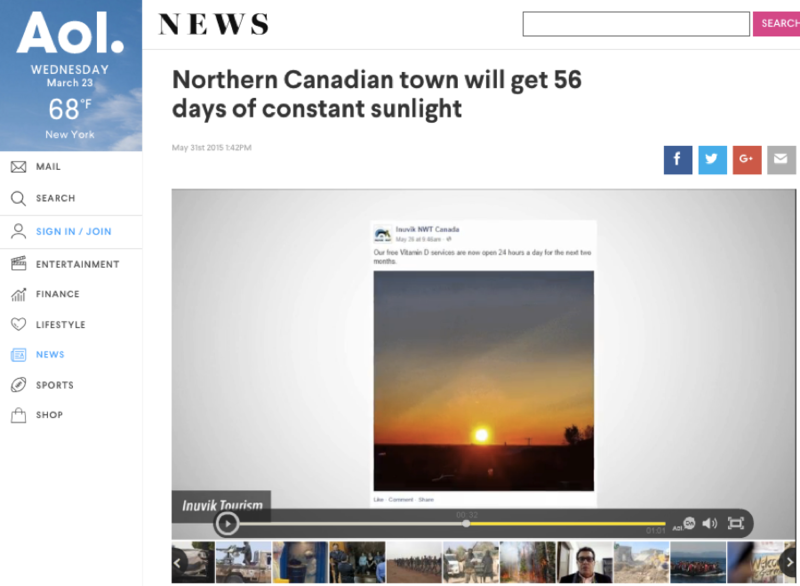 If tiny, arctic Inuvik can become an international news story and increase visitation through social media marketing, what’s holding your destination back? Want to boost your results? Destination Think! helps destinations like Tourism Inuvik, Tourism and Events and Queensland, and Destination British Columbia build greater impact with their content marketing. Contact us today to find out how we can help. Great bit of reporting on one of our Arctic communities. Too often the Canadian Arctic is ignored in the media and many Canadians know little about our neighbours to the north. Thank you, Patricia! I truly believe that the arctic is the next tourism frontier and the results with Inuvik show that.